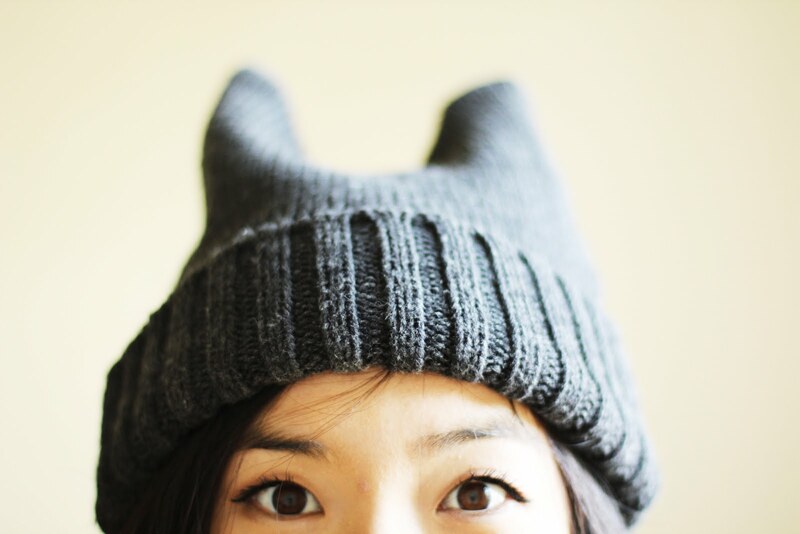 Hello world. I swear. I will keep coming back. One day I'll have things under control. =) I always think blogging is going to get easier, but it never seems to. I always seem to be out doing stuff instead of writing. =P Which isn't so bad. I've sort of been doing some thinking in terms of refining my restaurant blogs. I want to post all my initial reactions here in full glory on my main blog, but for the times I revisit restaurants or just want to take some cute pictures of food...those will go on my tumblr. Which you can find here! At the moment a mosaic of Disney photos, Sailor Moon gifs and some aesthetically pleasing fashion shots are making their home there, but I think soon my little tumblr will be unified through just pure food shots. =) Onto the actual post! Let's just say Japanese Izakaya style dining is very, very popular in Vancouver right now. 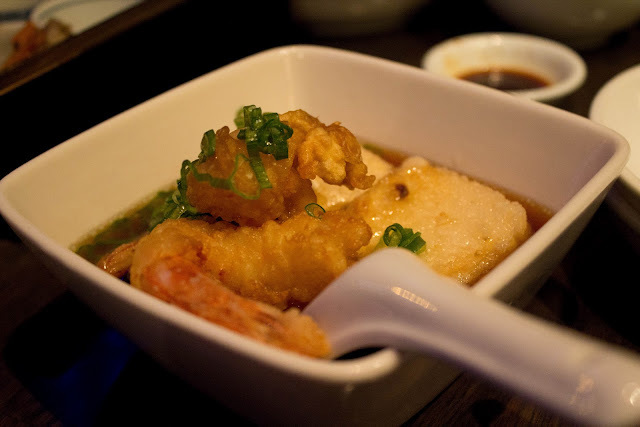 There are a slew of izakaya styled restaurants that have opened downtown, down Robson, and across Richmond. 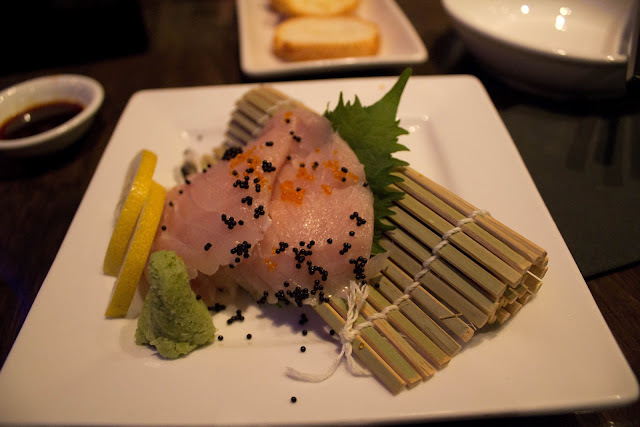 One of the many izakayas that have sprung up across Vancouver is Suika Izakaya located on West Broadway. I can finally put my Asian Area Studies Degree into use here. =P *Ahem* Traditionally an izakaya is defined as a Japanese drinking establishment that serves food that pairs well with the drinks. 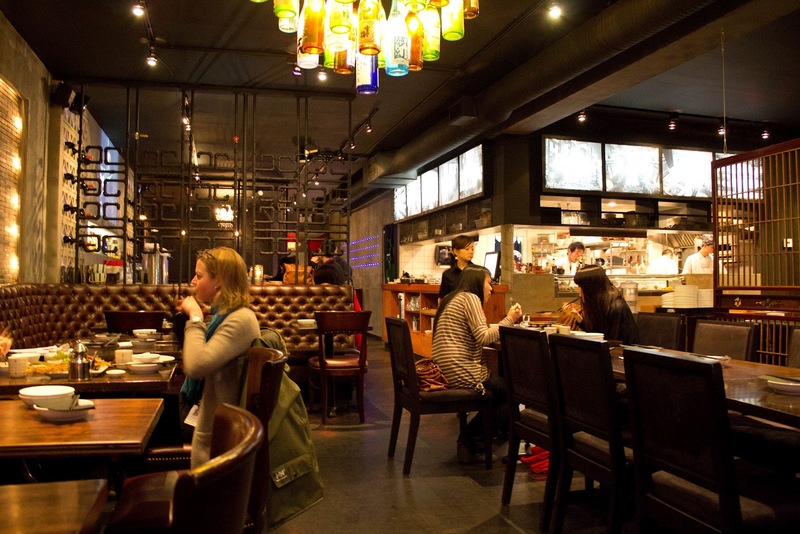 In fact, an izakaya is probably more primarily known as a casual bar or drinking spot for people to relax "after work." The izakayas I've been to in Japan are very casual, have large picture menus to simplify the dining experience and are very loud and boisterous. Izakaya dining is a bit like "family style" dining, except for the fact that most of the dishes aren't really hearty entrees, but more like light "finger food." 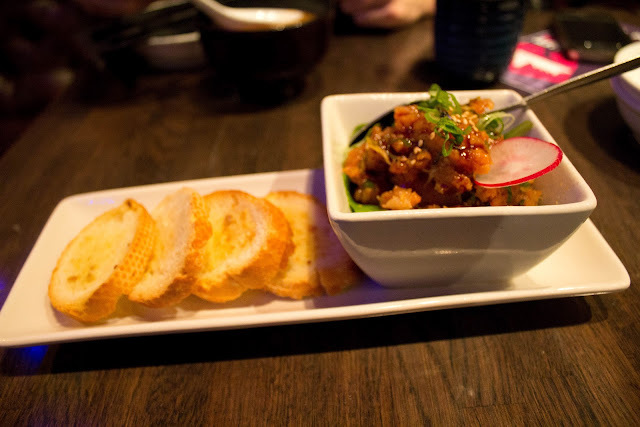 The Vancouver izakaya's carry on the izakaya culture that originated in Japan, however unlike Japan, North Americna Izakaya's focus much more on the food and the dining experience than the drinking and socializing side focused on in Japan. 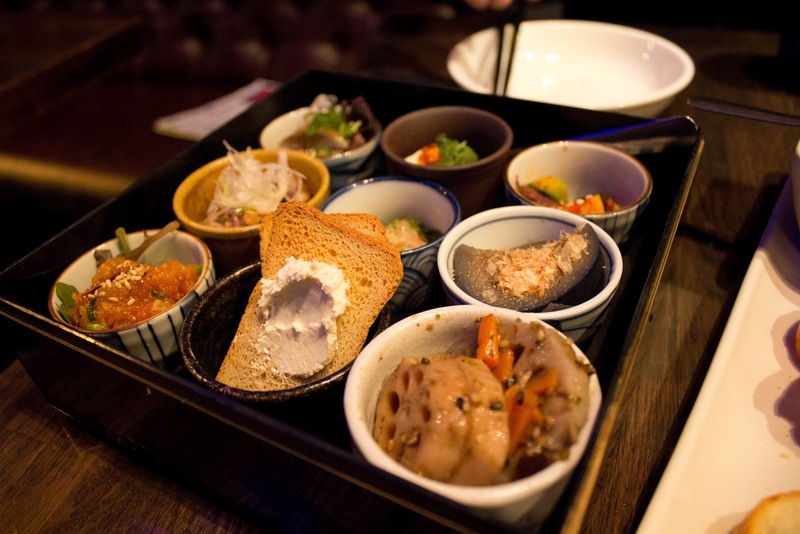 What distinguishes the many izakaya restaurants is not necessarily the cuisine, which all falls within the realm of "Japanese tapas", but instead in their presentation and approach to the foods and their decor. 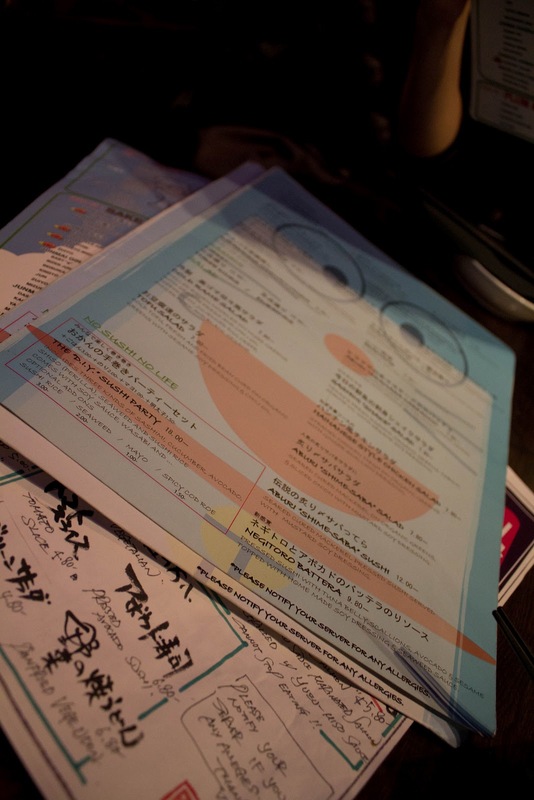 For Suika Snack Bar their cuisine, aesthetic, and general ambiance are solidly whimsical. 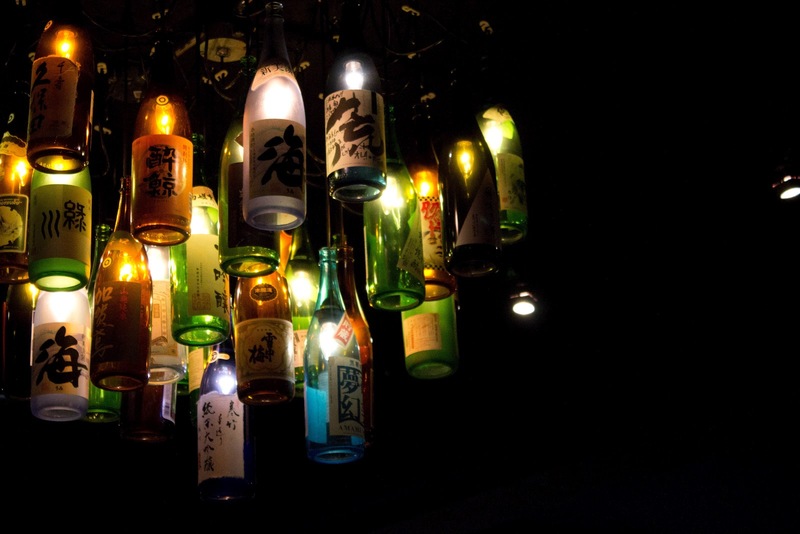 From their lovely sake bottle chandelier, to their doraemon menus, to their bowls and plates, everything is very eclectic and adorable. The staff was mainly Japanese and my friend and I were seated quickly and efficiently. There wan't a long wait when we went there, but I'm told that it would be wise to make reservations for Friday, Saturday, and Sunday. The entire aesthetic of the restaurant is a mix of dark colors, hard surfaces, and whimsical decorations. There is ample room for diners and table seating extends all the way until the back of the restaurant. From what I remember the floor and the walls are made of textured cement and the ambiance was that of an "authentic" izakaya bar: boisterous and lively. I am a soup hound and I love, love, love soups of every variety. 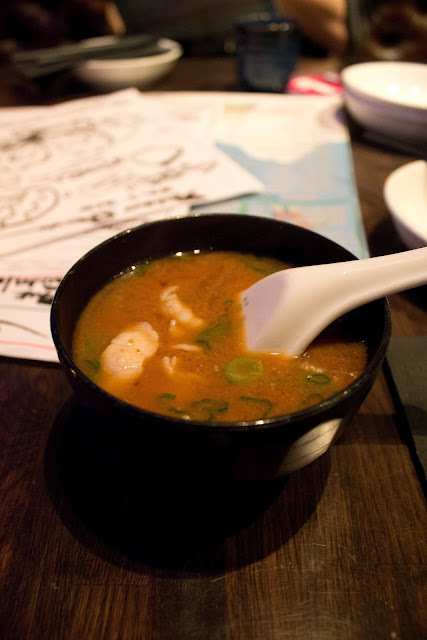 Miso is especially yummy and a staple item in any high or low end Japanese restaurant. You'll find miso in its most common soup form or in a glaze on some sea bass or maybe even in a sauce. Anyway, I'm sure you guys have encountered miso sometime in your Japanese dining experience. This Ton Jiru soup was honestly probably one of the best dishes that my friend and I had ordered that night. The pork and the vegetables were both very tender and the soup itself was thick with miso flavor. It was nothing like the watered down miso soups that come free with your $10 bento set, instead this soup was thick, flavorful and filling. It's a bit funny how photos can make you so hungry, but the one striking thing that I remember about this dish was how displeased I was about it. The presentation of the dish was aesthetically appealing and the macro shots of this dish make it look pretty tasty, but it was pretty much unanimously agreed upon that this was the worst dish among what we ordered. The toasted bread that accompanied the dish was dry and a bit tasteless, but served its purpose to accompany the negitoro spread....or should I say paste? Paste in this case is the word that most fit the food presented to us in the bowl. Usually negitoro, the meat scraped from the bones of tuna, mixed with green onions, and then blended into a paste, has a delicate, oily flavor that is accented by the sharp bite of the green onions. However, in this dish the delicate flavor of the negitoro was completely overshadowed by the addition of the chili oil and further diluted by the creamy avocado. The texture of the negitoro spread was somewhat uniform, only cut by the green onions and the sesame seeds, but once those ran out...it just became a fish paste. A bland one dimensional, homogeneously textured, blah spread. I don't recommend it. Deluxe Suika Box: Kind of Like a Jewelry Box...GORGEOUS! Includes 9 appetizers! This was the appetizer "special" that's advertised at Suika, the above description is theirs by the way, and again unfortunately I don't recommend this. Although the dish was only $10 dollars I felt like it was kind of a ripoff for the portions and the dish choices. Also it was a bit disappointing that they don't tell you what was included in the "Suika Box" previous to delivering it....as a result we got like a triple serving of a relatively meh dish. The other 8 appetizers included servings of: lotus root kinpira, the bread for the negitoro spread, kyuri kimchi, tori-yakko and others that might have not been on the menu. The remaining dishes I remember were a cold tofu dish, a picked cucumber dish, cold braised eggplant, and some slices of pickled mackerel (saba). As they say on the menu, 9 different kinds, but I'm not sure if they rotate out the selection. Honestly, I just feel like it just wasn't worth it. All the dishes' portions were too small for my liking and out of the ones that we sampled...none of them particularly stood out to me. My friend, who accompanied me to dinner and is a fellow glutton, seemed to agree with my sentiments about the portions and the general "unmemorable" nature of the dishes. This...was good and delicious in theory. I love anything fried, especially shrimp and tofu, but dousing the two in a soy broth just made the whole dish a soggy oily mess. What I enjoy most about fried things is the accompanying delicious "crunch"! The soy broth was just completely absorbed by the tofu and the shrimp and rendered any guilty pleasure I had in fried things obsolete. I think the soy broth would have been delicious, but the oil from the fried things leaked into the sauce and the whole thing was just a soggy, soft and oily mess. I really didn't like this. I think the dish could be improved by giving the soy broth in a separate dish as a dipping sauce or accompaniment. That way you cna keep the crunchy integrity of the tofu and the shrimp, instead of dousing the little fried morsels in sauce and rendering the entire dish soggy. I don't think I can recommend this...at all. 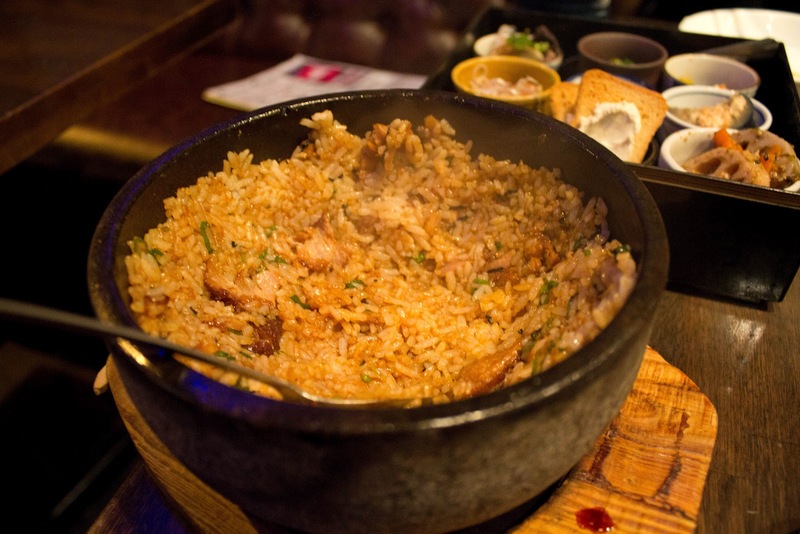 Kakuni Bibimbap: Stewed pork belly, sweet dried shrimp, and scallions on rice served in a hot stone bowl. HOT! HOT! HOT! The Kakuni bibimbap was by far one of the best dishes of the night. I highly recommend this dish and the above mentioned Ton-Jiru. 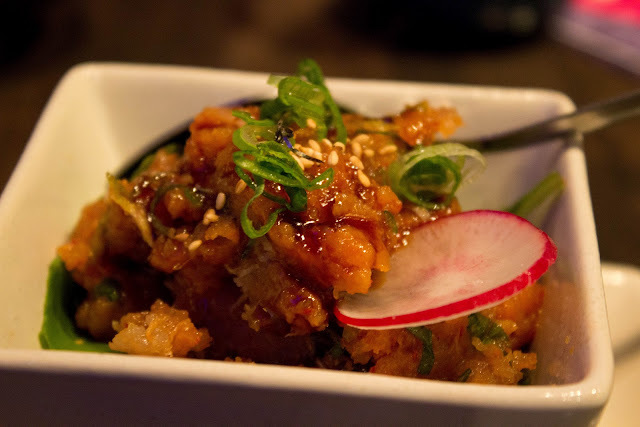 The pork was stewed to perfection, tender, and flavorful while the scallions and dried shrimp added a depth, complexity, and a Japanese twist to a relatively well known Korean dish, in its traditional egg, meat, and vegetable form. The rice at the bottom of the bowl became deliciously crispy and added a wonderful contrast to the succulent globules of glutenous rice that remained at the top. Each grain of rice soaked up the delicious juices and flavors from the stewed pork and the broth that the sweet dried shrimp were re-hydrated in. The flavour of this dish was complex, savory, and mouth watering. Compared to the relatively lackluster dishes that we ordered throughout the evening this was definitely a bright light in our rather dreary meal. Ultimately Suika was an unfortunately mediocre meal. The atmosphere, whimsical accents, and presentation were on point, but I do feel the food was rather "meh." I do know that Suika is popular and I often see its window filled with happy diners, but I don't think I'll return to Suika of my own free will. I can see myself going with friends who want to go and I can also see myself not taking the initiative to introduce the restaurant to them. If I do go back, I'll definitely order the Ton-Jiru and the Kakuni Bibimbap...and maybe something new! <3 Thanks for coming and thank you for your patience. Repeatability: Maybe...depends on the circumstance. If you go...be careful about what you order!